Here’s how we did with our goals this past month, and our goals for February. Put at least $900 into our travel savings. We put $6067.96 into our travel account, which included $5000 from my inheritance. Clean off one set of shelves in the garage. Done! The shelves before . . .
. . . and after. Everything on the shelf now is something that we’re going to sell (well, except for the Diet Coke – that is all mine!). Get my hair cut. Can you see how happy I am to have gotten rid of that big frizzy mess that was on my head? I tried a new salon this time and had a much better experience for the same amount as I was paying before at a different salon. Get Brett’s hearing aids. They were fitted a little over two weeks ago – yeah! He saved a bundle by choosing the Kirkland brand of appliances at Costco. Have new glasses made with my updated prescription. I love having red glasses again. I also saved a bundle by ordering the frames online, and having the glasses made at Costco. Update our wills. Done! Besides creating our wills, the software we used also allowed us to prepare advance health directives and a durable power of attorney to handle our finances if we become incapacitated. And, we got the software for free! Take at least one bag of items to the thrift store. We took in three bags and one large box of stuff that WenYu cleaned out of her closet. 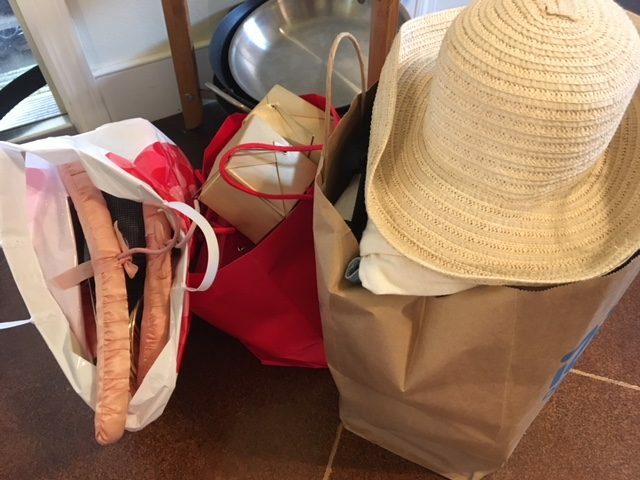 Three bags of stuff ready for the thrift store. 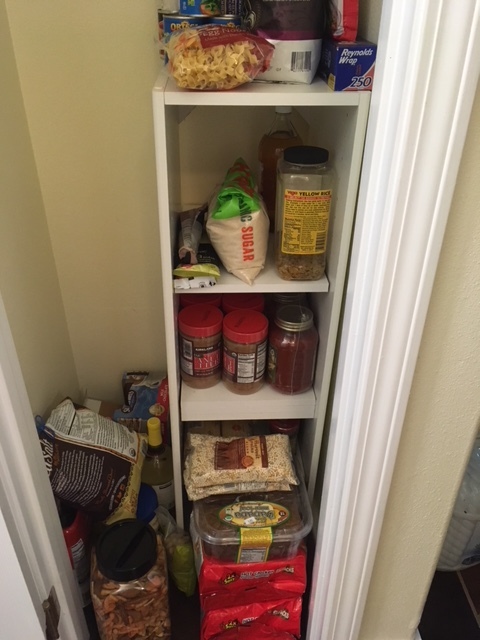 Combine all pantry items into one closet. 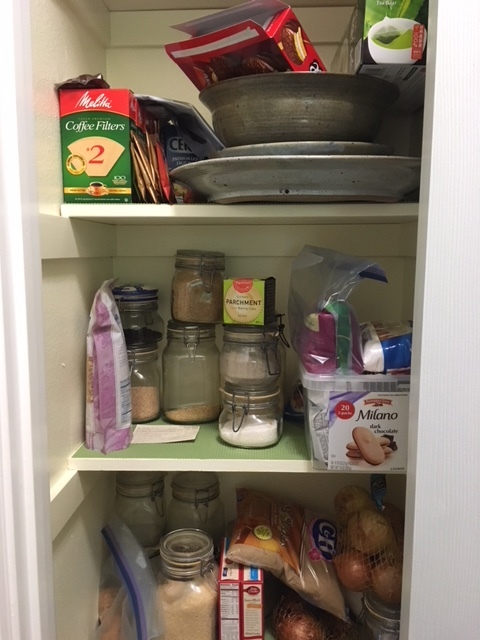 We currently use two small hallway closets for our pantry, but will downsize and condense into one. We want to clean out and organize this closet . . .
. . . so all of this will fit in there as well. Make reservations for an overnight stay on the Big Island, and a two-night stay at one of the PMRF cottages during spring break. Camp Kilauea on the Big Island is inside Volcanoes NP, and very affordable. The cottages at PMRF out in Waimea are one of the best places on the island to see the sun set, and a good base for Brett to do some Waimea Canyon hiking. Decide on bed pillows and cases to take along on the Big Adventure. We’ve got a few options in mind, but need to make a decision. We’ll wait to buy in March though. Next Post Wanna See the Sights? Sounds like it was a great month for meeting your goals! I was very impressed by the travel savings amount! I love seeing the before and after pictures of the shelving unit. I really want to clean out some closets in my house. I’m getting the spring cleaning fever (even if it is currently snowing outside). The amount from my mom gives us a nice cushion. We’re not going to go crazy with it, but it will allow us to make a couple of side trips that weren’t affordable before. We’ve added a few more things to the shelving unit since I took the picture, but it’s all stuff that we’re going to put out for sale later. Actually, the shelf has already been sold! We have two of them, but the other one is still a mess. Over half of what’s on it though will go into storage. 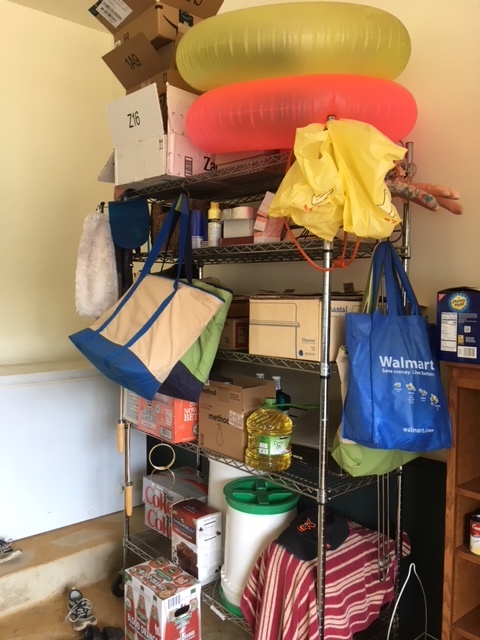 The decluttering bug has bit us here – we work on it almost every day now. Some projects are small, but others (like the pantry closets) will be harder. Well done with your January goals! The red framed glasses suit you. I’m interested in learning more about the cottages at PMRF in case it’s a good accommodation option when I visit the island. The PMRF cottages are for military only. They’re very affordable, but very, very basic and not in a great location for seeing the island because they’re at the far end of the west side. They’re mainly a place to go and completely relax, but Brett wants to hike in Waimea Canyon, which is hard to do from where we live, and would be easier if we’re at the cottages. 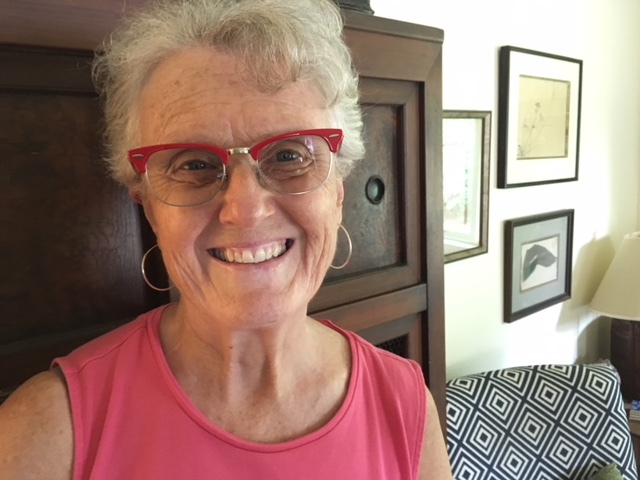 I am so happy to have red glasses again – they give a nice pop of color to my face, and they’re a good neutral. Weird question, but have you ever posted a picture of your kitchen? It would be neat to see where you guys cook. Yeh, I’m weird like that ha! I took a picture and will post it on Sunday! The kitchen is nice, but small, and there’s no dishwasher. We added a stainless worktable though that’s very functional. Will you be blogging throughout your year long trip? Yes! But probably only once or twice a week. We will be posting daily though on the Instagram account. 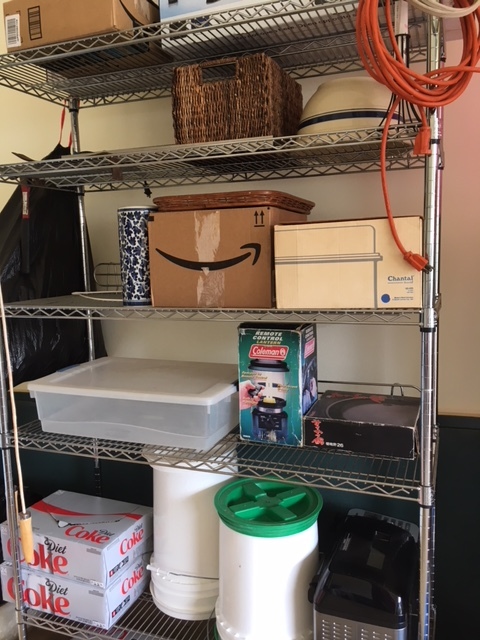 We are trying to keep things “small and manageable” for now with the decluttering so that we don’t get overwhelmed at the end. So far so good. Our biggest worry is going to be cleaning this house to our landlord’s specifications. This was the cleanest house I’ve ever moved into, better than new, but we LIVE here, and I’m not sure we can ever get it that way again, or whether he will consider normal wear & tear. The house will be clean, but not sure if we can get it as spotless as he will demand. The stylist gave me a great cut, but she blew it out so it looks straighter than I usually wear it in the picture. I am so happy to have short hair again – curly/fizzy hair and Kaua’i weather/humidity were not a good combination. I love my new glasses too!